No time to chat today! 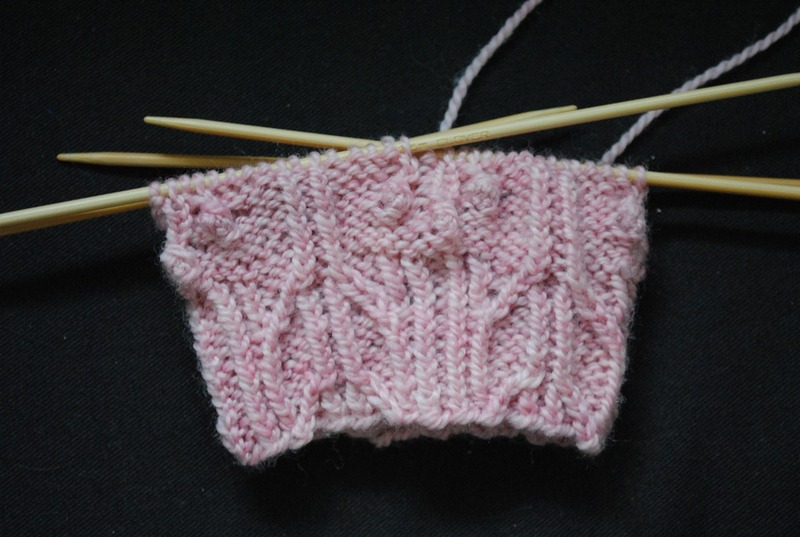 Just time to show what’s on the needles. And what I’m reading. I’m going to link up with Ginny AND Tami! Let’s GO! My Lovely Mystery Kal Sock. Too bad Chris’s project below has caused me to fall a bit behind! Loving the way the pattern is coming out though and yeah…I totally cheated and checked everyone’s progress for week 2. LOVE! I think I picked a great yarn, OceanWind Knits Merino Sock Yarn in Tickled. k.
My Lightweight Pullover. 15 raglan increases in! I’m knitting a modified version to fit a small (smallest size was 35” bust), so I only need to complete 24 or 26 total. Getting there!!!! Here’s The Pattern by Hannah Fetig. 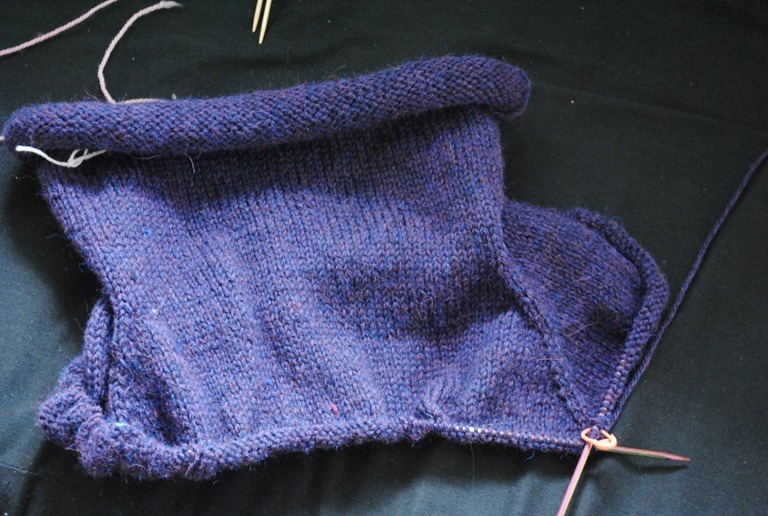 I’m using Knit Picks Andean Treasure in Indigo Heather and size 3 needles. And Chris’s gloves. He requested black gloves and I could not refuse. He is my beloved after all, and my beloved must wear my knitwear. Facts. Of. Life. He also looked at me with the sweetest saddest face the other night when I was NOT working on his project, and said “You dont love me!!!!!!!!!!!!”. He was only kidding but it left quite the impact. Should have these done in no time, as they are aran weight knit on size 7’s! The first one fits like a charm 🙂 The pattern is the Ken Gloves by Berroco Design Team. 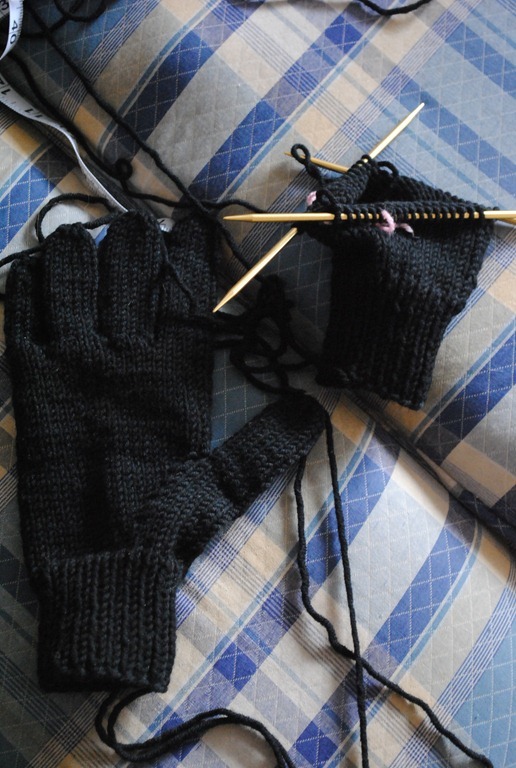 I am using Zara Yarns 100% merino in black. 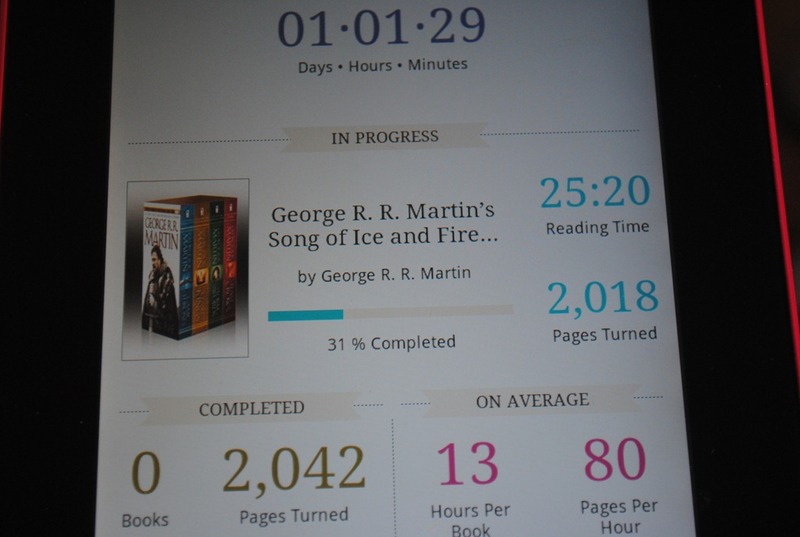 I’m currently on to the second book in the series, and can you believe how much I have READ!? 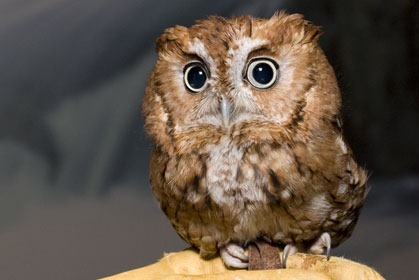 Geeeez. Only thousands of pages and over a day of reading. Did I mention I bought this a couple days after christmas? You get a lot of reading done when you knit and read at the same time. A lot. What are YOU knitting and reading today? WARNING!! 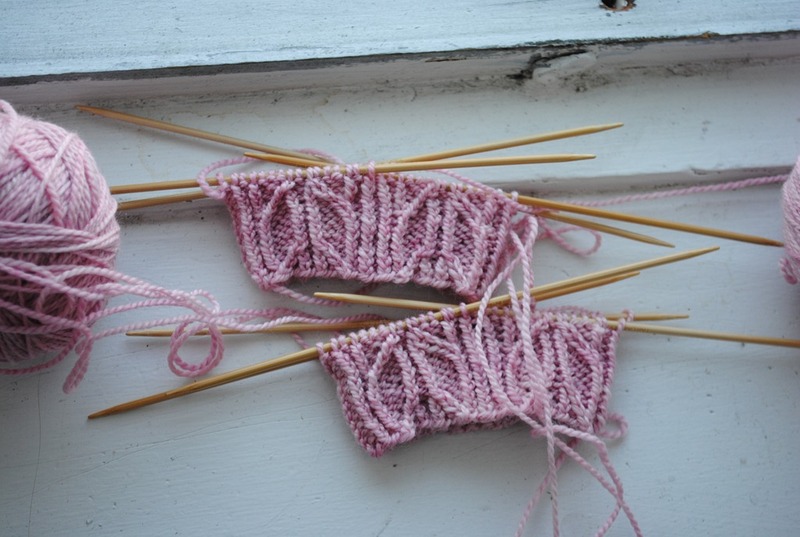 I WILL BE POSTING PHOTOS OF THE WEEK #1 CLUE OF THE TTL MYSTERY SOCK KAL COMPLETED BELOW. Originally I wound the skein up into 1 ball. 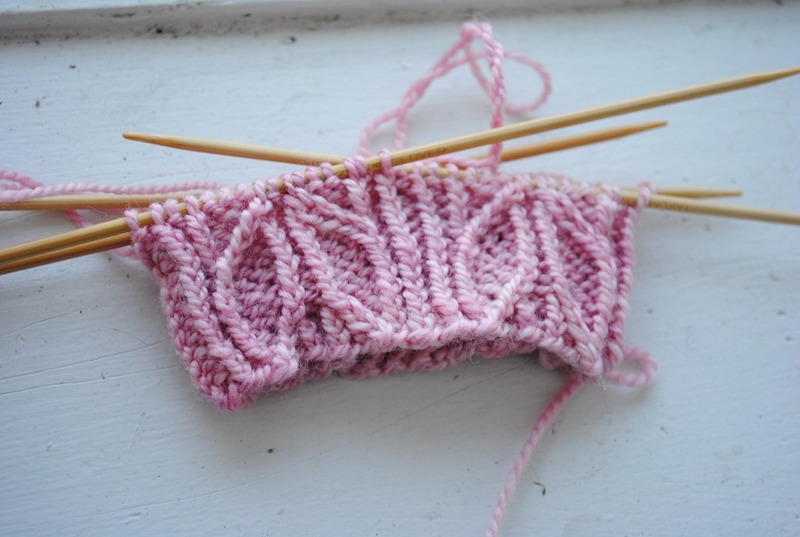 After I finished knitting the first cuff I realized I wanted to start on the second cuff right away. 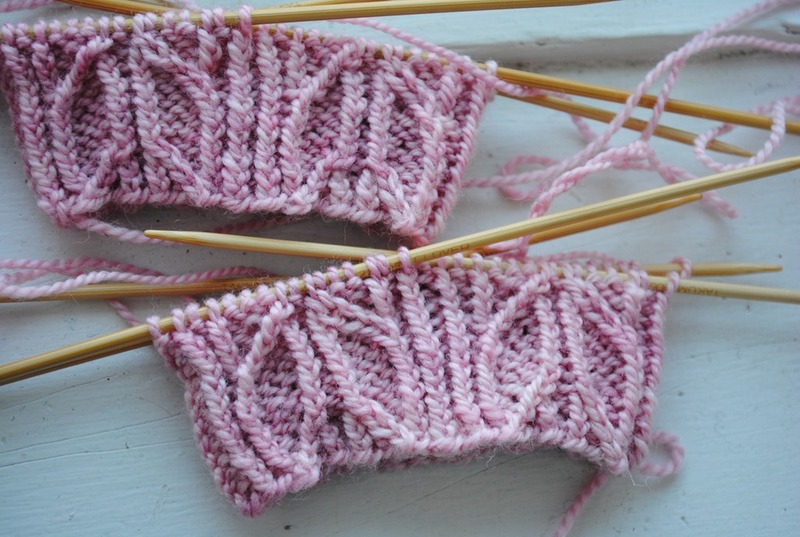 It’s going to be way more fun to have a complete pair of socks at the end of the KAL rather than just 1. I rolled half of it into a centre pull ball and got on with it! I love the pattern already. The cuff is really unique and I keep wondering what it will be! To me it looks like a peace sign. Some people say tulip or leafy. I cannot wait until next clue! I’m seriously in love with the yarn I am using too. It is soooo soft and such a lovely color. these photos are pretty accurate. The Yarn in Oceanwind Knits 100% merino sock in Tickled. It is smooshy and strong and beautiful and I love it! end of story.